The actress: British native Jean Marsh has had a long, distinguished career in both the United States and the United Kingdom since her first film, 1952’s made-for-TV The Infinite Shoeblack. And though she’s been in everything from the original Twilight Zone to a recent British miniseries of Jane Austen’s Sense & Sensibility, she may be best known to American audiences for a pair of villainous roles—playing evil witches in both Return To Oz and Willow—or for the role that won her an Emmy, Rose Buck, a maid confronting the problems of the early-20th-century British class system on Upstairs, Downstairs. Though not credited for any of that series’ scripts, Marsh and her friend Eileen Atkins created the series, which won several Emmys for best drama series. And in 2010, it was revived with a sequel. The first season aired to huge ratings on British TV, then performed well on PBS as well. Marsh was the sole cast member from the original to return to the remake, in her original role. Before production of the second season began, however, Marsh suffered a mild stroke, one that kept her from appearing in the majority of the second season. (She ultimately was able to appear in two scenes.) This interview was conducted during publicity for the first season. The A.V. Club: So the upstairs wasn’t always a part of it. How did you come to explore that divide? AVC: The series was quite a big success in the United States as well. How did it end up on PBS? JM: It’s quite a funny story. In the normal way, the people from London Weekend Television, who made the series, approached PBS, but it was then called ENT, Educational Network, I suppose. Yes, Educational Network Television. And they expressed interest, and a deal was being made when somebody who worked with them from Masterpiece Theatre—which was backed by Mobil, this somebody was an Englishman—and he said, “But this isn’t a masterpiece. And we always have things that are adapted from masterpieces.” So the deal was canceled. But then about a year later, the head of Mobil Oil, he was going to London, and he called a friend of his, the Duchess of Argyle, and he said, “Can you have dinner on Sunday?” She said, “No, of course not. Nobody goes out for dinner on Sunday. We all stay in and watch Upstairs, Downstairs.” So she invited him, and he thought, “Well, I remember that we were going to buy this.” And he watched it with the duchess and her maid all sitting at a table, and he decided that he liked it very much. So he went back to Boston and said, “Listen, we give you a lot of money for Masterpiece Theatre. We think it is a masterpiece.” And that was that. AVC: How did you decide to bring the original series to a close? JM: Well, mainly, I think everybody had agreed that five series was enough. It had become so successful, you know, that it really was pleasing. And we didn’t want to be something that just became a soap opera. That was one thing. And then the downstairs people all had other work. [Laughs.] They recorded that last series out of order, so I could go to New York where I was doing a play. So it was almost like a downstairs rebellion, everybody gave in their notices. But in fact, the producers agreed that that was fine. Although the head of the studio kept offering more money and said to me, “I’ll call it The Rose Show.” I told him it wouldn’t make any difference. AVC: It’s been very influential, and there have been lots of stories that have borrowed that structure. What about that world, England before and between the World Wars, is so appealing to people? JM: The first World War ended in what, ’18? Then long before ’38, you knew there was going to be some kind of war, maybe not a world war, but the internal wars Hitler was planning well ahead of time. There was a sort of hysteria. In England there was the general strike [of 1926], which was basically broken by the toffs, who were driving trains for a lark, that sort of thing. So there was a degree of anger, but also, stretching over into the ’30s, there was a sort of irresponsible lightheartedness. The “bright, young things” I think they were called, and it happened over here, too. They were the first, sort of, wicked teenagers, and there were even drugs and alcohol abuse. So everyone was interested in how could we let such a disaster, which of course we won—America and England won that war—how could we let it happen again so quickly? You know, my parents lived through two World Wars, so I think that’s why people were interested. And also, communications were increasing, not like today of course, but we knew a lot of what was going on all over the world. I mean even in 1915, 1916, there was the terrible attack on the Armenians, hundreds of thousands, maybe millions, died from border fighting and about religion. So there was a real sense of danger, and I think that makes people behave both sexually and with drugs in an over-liberated way. That’s why it’s interesting. JM: Aww, I loved doing that! AVC: It’s kind of a cult classic over here. JM: Is it? Oh well, the director was an extraordinary man; well he still is. Walter Murch is probably the greatest soundman ever. For 10, 20 years, whenever anybody, a sound editor, won an award, he always thanked Walter Murch. And I’m sure Bob Altman was influenced by him with all his layers of sound. So [Murch] was so successful that he managed to get to direct his first movie, and he chose Return To Oz, and he chose to do it in a rather interesting way. I think it was a Walt Disney film, but it was NOT a Walt Disney film in content; it was very, very dark. I know people who were very frightened when they saw it, and it was more successful when people could buy it, and children could sit at home with their parents. But it was wonderful to do. He was very imaginative and interesting, and the actress, the young girl, Fairuza Balk, who played that part was very good, and she’s still… She’s not a star, but she’s a successful actress. But I loved doing it. AVC: The original Wizard Of Oz, which this was not a sequel to, was such an iconic movie. How did you deal with going into this world that people were familiar with and making it very different? JM: Well, I’d never seen it, so that was a help. And I knew the actress. I’d seen the work of the actress who played the witch and the nurse, and I was so unlike her that I knew my attack would be different. And there was quite a big stretch of time between the two. Of course, a bit like doing Upstairs, Downstairs again, you have to be on the alert that people will be angry with you for doing it again with other people, but I think that it was well-enough done that people didn’t get angry. The appreciation of it wasn’t wholehearted instantly, but it did grow and grow. AVC: British broadcasters are very famous for doing the classic Jane Austen and Dickens novels, books that have been reinterpreted many times. How do you go into something like that and make it your own? JM: Well, I very rarely watch classical adaptations, because they usually do very good books, and a lot of the things they do… I just don’t watch at all. Middlemarch is one of my favorite books, so I never watched an adaptation of it, so I don’t worry. But in Sense & Sensibility, it was a fantastically good role, not a big role, but it had reverberations throughout the whole film. I think people talk about my performance in it as though I had a leading role and I didn’t, it was a comparatively small part. But I had to test for it; I wasn’t offered it. I had to test for it, and I did something quite brave: I played it in a way that I thought they wouldn’t expect. And they were pleased because they had seen a lot of tests, and they liked my take that was of a woman who was strong and bitter, but you could see her core as well. So I was very lucky to get that. I enjoyed it very much. And I met one of my new best friends on it: Mark Gatiss, you know, who wrote Sherlock. [Gatiss also plays the role of Mycroft Holmes on Sherlock. —Ed.] Then he wrote The Crooked House, which was a three-parter. I don’t know if it’s been shown here. AVC: And what’s that one about? JM: It’s about a house that is infested by ghosts, and it infects people who live there; he wrote a part for me in that. JM: Oh that was so strange, because I didn’t have anything to do in it, really. Wasn’t I only in over the introduction? AVC: You’re in it very little. I know that much. JM: What I love is, I knew George C. Scott. He was a friend, and he was a very funny man. I remember once he came to England, and he stayed with me. I was up in Stratford, and we were walking over a bridge, and there were swans fighting. And one of the swans was backing into a corner, snarling, and he said, “That’s George C. Swan.” [Laughs.] But that was a very strange thing because, my eyes aren’t the same color now, I had an operation and they changed my color, but my eyes used to be a very strong green, and George’s eyes were a strong green, but our daughter in the movie had brown eyes, which is absolutely out of the question. It never happens. You cannot get it, genetically, so we thought it was a bit creepy. JM: Oh yes, yes. It was fabulous, in a way. I treated it with a lot of respect because it was being produced by Jane Fonda. And, again, I had to test for it, which I sort of did reluctantly because you have to sign, ahead of time, a five-and-a-half year contract, but I thought, “Well, it isn’t necessarily going to be done.” And I doubted if I would get it because I was told—I was living in New York and they flew me out there, and they said, “They HATE the English accent, so you must do it in an American accent.” Which I’ve always been able to do because I’ve lived here such a lot. I’ve done American accents, so I said okay. 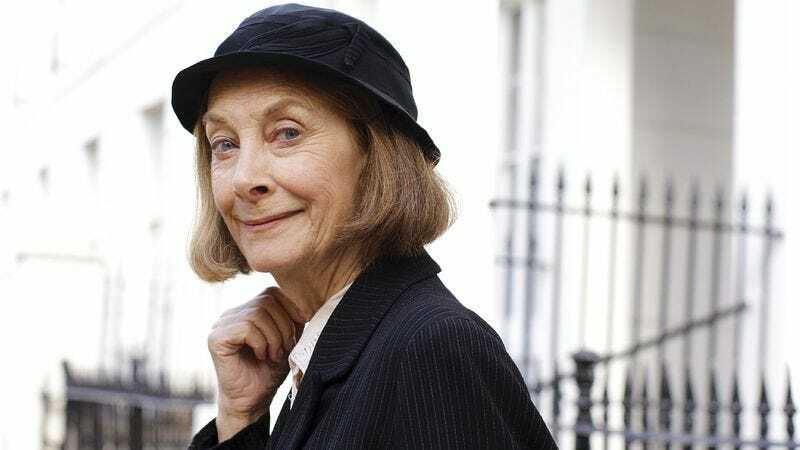 And I heard them laughing and as I left, I hung around a bit, putting my things together, and I heard somebody say, “Who do you think?” And they said, “Oh, Jean Marsh with the English accent.” So, it was good being disobedient. Then we did four episodes doing it on film, which were like the pilot, and they were hugely successful. Then they changed the whole tack. They did it in a studio, and the writers, everything about it was different, and I was terribly unhappy, and I thought, “Oh, I don’t want to be in this for five and a half years when it’s not quite what I had in mind.” So I begged and begged and begged and somebody in the company said, “Look. She’s a very good actress. Let her go.” And they said, “But we want a very good actress!” [Laughs.] But finally they let me go. AVC: The British TV system is very different from the American system. What were some of the biggest differences for you to get used to? JM: Well, I was already used to working in America. I can remember doing things like Twilight Zone, for instance. I was either in the first or second Twilight Zone. And all sorts of bits and pieces. I knew that it was very rarely shot in continuity, and that you quite often did all your close-ups with somebody changing your hats or your jacket, all in one go, so I was used to it. I wasn’t too worried, although Nine To Five was a long time after. I had also done a few things after doing the program on Broadway, I did a couple of television shows there as well. I was quite familiar. I was quite comfortable. And I knew a lot of American actors. I’ve always kept up and observed, because American TV and film actors are very fine indeed, and I always thought I could learn a lot from them. JM: I was in the very first series, I think, which has probably been wiped. I can’t remember what it was called, but I remember I played a Princess of France in the 10th century. That was just one episode. Then I came back as Sara Kingdom, sort of a space spy, fabulously ridiculous, wearing a catsuit of very tight, elastic brown tweed. Why one has to wear those sort of things… It was a bit like Joanna Lumley. It was just to show your body, I suppose. So I did eight episodes of that and turned from being a baddie into being a goodie. Then I was killed in a brilliant way. I was running—in my catsuit—away from someone who was trying to kill me, and he had an aging gun. And he hit me, and I started aging very quickly, and they had to keep switching my makeup, and then the last shot of me was of a very, very, very old woman. So that was terrific. Then the third one was Morgan le Fay with King Arthur. I loved doing that because they were beginning to take Doctor Who more seriously, and that was a bit more fun. AVC: When that series first started it was all done on a shoestring. Was that fun to play around with and pretend all of this stuff was going on? JM: Oh yeah. When I finished my four-parter as Morgan le Fay, we rehearsed, and I was supposed to have some kind of crystal ball. And I could see what was going on. For the purposes of rehearsal, I was given a sort of lampshade. And so I rehearsed with it and rehearsed with it, and then I said, “Look. We’re recording. We’re filming tomorrow. When do I get my bally, my crystal bally? I want to know what it is.” And they said, “You’ll get it tomorrow.” Well, morning came, and they said, “Well, we’re going to run-through and then shoot,” and I said, “Where’s bally? Where’s my bally?” and they said, “No. We’re just going to use that old lampshade.” [Laughs.] So it was very difficult not to laugh. That was real sort of cheapskate. AVC: George Lucas wrote that, and then Ron Howard directed it. JM: Oh, that was wonderful. That was George Lucas? Yes, because George Lucas had been incredibly helpful to Walter Murch on Return To Oz. Walter had had some problems with his lighting cameraman, because he wasn’t used to dealing with a crew. It seemed that Walt Disney might move him off [the film], and Walter’s wife called all the people who loved him in San Francisco and Los Angeles, and that included George Lucas, Steven Spielberg, Francis Ford Coppola, and so on, and they all, one by one, came over to the set for no money and stood with Walter to make sure he was all right. So, I was disposed to like George Lucas. And I did have a lot of fun doing it. Again, it’s wonderful to snort at pigs and to say [snorts] to people and that you’re going to turn them into pigs. That was huge fun. I used to walk down the street, and kids would look at me and [gasps] and run away from me. AVC: It seems like after the success of Upstairs, Downstairs, a very realistic series, you ended up in a lot of science fiction and fantasy and horror. Why do you think that is? JM: Over the years we’ve often been asked to do it in various different ways. And sometimes it’s been optioned, and then it just didn’t work out. We didn’t like the scripts and it fell through. And I think it wouldn’t have made a movie. The one thing that we were offered that just petered away but was very exciting, was to be in a musical, with Hugh Wheeler doing the book and Sheldon Harnick and Burton Lane doing the music and lyrics. I mean, that would have been fabulous! But that disappeared. So when the BBC asked to do it as a series, it was logical. That was one thing. And then Heidi Thomas, who wrote the scripts and who adapted Cranford, thought—as Eileen and I had always thought—it should go forward in time, not stay in the same period and not go back, because of the whole thing of people remembering the faces of the original people. So 1936 was only six years later, but it was ideal. Ideal, except of course, for me, because they wanted me to be Rose again. And in screen time, it’s six years later, but in real time… [Laughs.] It’s 35 years later, and I did say to them, “You have to be very kind to me.” But it was on HD, and that’s just so violently horrible. There are Hollywood stars that won’t work in it. So that was a little bit tricky. AVC: It was a very big hit. Was that gratifying? To have it still be in the British public consciousness? JM: Oh, yes. I mean, the minute it was announced, I started to get letters from people saying, “Thank God, it’s coming back.” Everybody was pleased before it even went into production. And when it was shown, it was shown three nights in a row after Christmas. I never had less than 20 people approaching me in the streets and the shops and the supermarkets saying, “We’re so pleased it’s back. Oh, it’s fabulous.” It got an instant appreciation.